House Minority Leader Nancy Pelosi (D., Calif.) received a "Mostly False" rating from fact-checker Politifact for a tweet about wages in which she claimed House Speaker Paul Ryan was wrong to say "wages are rising." At tweet sent from Pelosi's political team on July 26 claimed wages fell 1.8 percent in the second quarter of 2018 and links to a Vox article arguing the GOP tax cuts aren't boosting wages. Democrats have stood in staunch opposition to the tax reform law, which President Donald Trump signed into law at the end of 2017. "Paul Ryan on June 24th: ‘Wages are rising.’ Reality: ‘Between the first and second quarters of 2018 — after the tax cuts were enacted — real wages fell by 1.8 percent,’" the tweet said along with the link to the Vox article. However, Politifact points out the source of the numbers cited by Vox and Pelosi is problematic. The data comes from the PayScale Index, which is produced by a private group. When referring to employment statistics and wages, the federal government's numbers are considered the most reliable and accurate. When the numbers from the PayScale Index were first used by CBS News and Bloomberg, the official numbers from the Bureau of Labor Statistics for the second quarter of 2018 were not available yet. When the Bureau of Labor Statistics did release the official statistics for the second quarter of 2018, it instead showed a wage gain of just less than 0.3 percent. 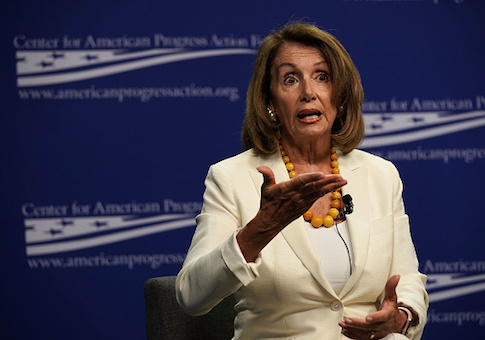 Politifact said in its final ruling that there was only "a grain of truth" to the claims from Pelosi and others of falling wages. "There's a grain of truth, in that one unofficial measurement did produce that finding. But it is an outlier," Politifact said. "Official statistics contradicted that, showing stable or modestly rising wages. Those were available before the recent social media traffic. We rate the statement Mostly False." This entry was posted in Politics and tagged Economy, Minimum Wage, Nancy Pelosi, Politifact, Twitter. Bookmark the permalink.